In the early morning hours of Sunday, September 29, 1912, brutal murders were committed in a lonely house near Payson, Illinois – a quiet farm community east of Quincy. The murders would stun the people of western Illinois, ruin the lives of the accused killer and his fiancée, and shock the Midwest. The murders in Payson occurred just months after the brutal slaying of the Moore family in Villisca, Iowa, a case that was still making headlines in the region. Those murders – along with several others that I believe were committed by the same killer – had not been solved and had many wondering if the Illinois slaughter was linked to the events in Iowa. On the morning of September 30, news reporters in Quincy were already at work fanning the flames of panic. “Murdered in Home!” screamed the headlines, spreading the news of the previous day’s events. The newspaper columns told the story of the quadruple murder of Charles Pfanschmidt, 46; his wife, Mathilda; 15-year-old daughter, Blanche; and a young schoolteacher named Emma Kaempen who boarded with the family. The bodies were discovered in the Pfanschmidt home -- just outside of Payson and west of Quincy -- after a fire swept through the residence on Sunday morning. The police surmised that they might have been killed as early as Friday night and the fire set the next day to destroy the evidence. Telephone lines to the house had been cut, making it impossible for friends to reach them on Saturday. Neighbors spotted smoke coming from the house very early on Sunday morning and alerted the authorities. By the time they arrived, it was burning nearly out of control. The fire nearly destroyed the house, and when the metal roof was removed, the bodies of three women were found lying on blood-soaked mattresses in what would have been the upstairs bedrooms of the house. The roof had preserved the corpses well enough to reveal that the women had been bludgeoned with an ax while they were sleeping. The bodies were those of Matilda and Blanche Pfanschmidt and Emma Kaempen, 21. 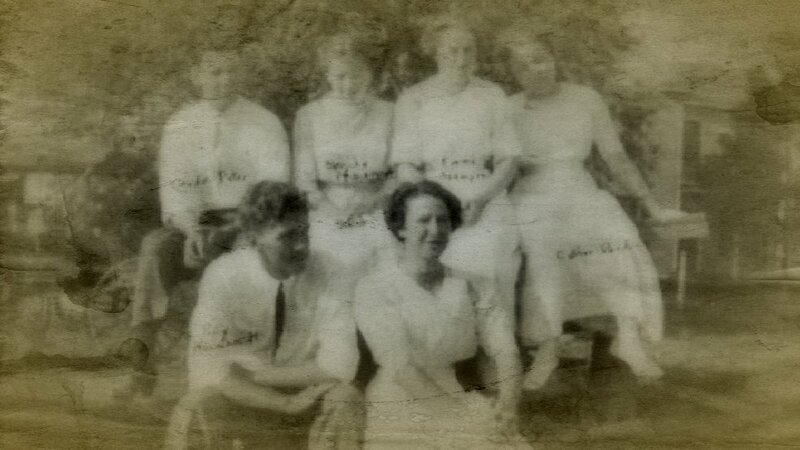 The young woman was a local schoolteacher who boarded with the family. Another body – charred almost beyond recognition – was discovered in the ruins of the cellar. The flesh and bones of the head, arms, shoulders, upper trunk, legs and half of the lower trunk were gone. Only one thigh remained. A doctor later testified that the body had been dismembered with knives and a saw before it was burned. It was eventually determined that the body belonged to Charles Pfanschmidt. Near the body in the cellar was an ax head with what was later determined was human blood baked on it from the intense heat of the flames. The handle of the ax had been completely burned away. Police officers and sheriff’s deputies immediately descended on the scene, gathering law enforcement personnel and armed citizens to search the countryside for the killer. Bloodhounds were brought to the scene in an effort to trace the murderer who, it was believed, had driven to the home in a buggy on Saturday night, a few hours before the fire was discovered. The Iowa murders were still fresh in everyone’s minds. Newspaper reports stated that the police were seeing the “degenerate who had perpetrated similar ax murders in Iowa and Colorado recently.” They also noted that the crime was “similar to the horror in Villisca.” This new murder got the attention of the Iowa Attorney General and he asked the Burns Detective Agency to send a man to look into it. C. W. Tobie, who had worked the Villisca case for a few weeks in July and August before going on to manage the agency’s Chicago office, assigned himself to the investigation. Before he made it to Illinois, though, authorities in Adams County had already arrested Ray Pfanschmidt, 20, the only surviving offspring of the murdered couple. The young man had moved out of the family’s home in August to start work on an excavation project for the Chicago, Burlington & Quincy Railroad. He was living in a tent near the worksite. The main evidence against him was a set of buggy tracks that led away from the Pfanschmidt house – and which may, or may not, have matched his buggy – and suspicious bloodstained clothing that may have belonged to him. The clothes had been discovered by accident. J.L. Freese, who lived near the work camp, was making improvements on his property and moved an outhouse to a new location. When the structure was moved, he found a bundle of bloody clothing hidden beneath it and called the police. The khaki shirt and pants were splattered with blood – which could have been either human or animal, because the Adams County Sheriff had no way to test it – with the largest stains measuring about two inches in diameter. When the police showed the clothing to Ray’s fiancée, Esther Reeder, she said that they might belong to him. This was not exact hard evidence, but in those days, the police could arrest just about anyone, whether the evidence against them was solid or not. Soon, other information emerged, however. On the surface, none of it looked good for Ray. Charles Pfanschmidt had owned a considerable amount of real estate and his wife had owned large tracts of land that she had inherited from her father. Upon the deaths of the older couple, their land and money was to go to their children, meaning that Ray stood to gain a large inheritance after the murders. It was known that he had money problems. In the weeks prior to the murders, Charles received two notes from his bank informing him that his son’s accounts were overdrawn. Charles had allegedly complained to a friend about Ray’s spending habits. That was all the motive that prosecutors needed to pin the crime on Ray. Detective Tobie soon arrived from Chicago. He was supposed to see if he thought that the murders in Villisca and Payson were connected and he talked to a few people and visited Ray Pfanschmidt in jail. After meeting with the Burns detective, Pfanschmidt hired Tobie as an “expert witness” to testify that the murders could have been committed by the roving ax maniac who had slaughtered people in Colorado, Kansas, Illinois, and Iowa. Tobie, considered an expert in the other cases, was supposed to provide an element of reasonable doubt for the defense. In the end, it worked – but it started off badly for Ray. At the initial trial in March 1913, Ray was tried and convicted for the murder of his sister. It was common practice in multiple murder cases to charge the defendant with only one death. That way, if he was exonerated, he could be tried again for another, allowing the prosecutor to skirt past the double jeopardy rule. Ray was found guilty and was headed for the gallows in October. The evidence against him was circumstantial, but Ray was perceived as being greedy and spoiled. It didn’t help his prospects when his grandfather testified in court about his constant demands for money. My book, MURDERED IN THEIR BEDS, mentions the Pfanschmidt murders as one of many such horrors that occurred in the Midwest during that era. The murders were, however, not connected to the Villisca murders or others of the time. His lawyers appealed the case, stating that a change of venue request should have been granted due to extreme prejudice against the defendant expressed by people living in the area. They argued that some of the evidence (including letters from the bank regarding overdrafts) should not have been admitted. In February 1914, Pfanschmidt was granted a new trial by the Illinois Supreme Court. He was retried for the murder of his sister and found not guilty. He was then put on trial for the murder of his father and reasonable doubt won out again. The case for the murder of his mother was dismissed and the authorities didn’t try and convict him again. Pfanschmidt collected his inheritance and left Adams County for good. Many people strongly believed that Ray had gotten away with murder. If so, C.W. Tobie helped him. For a time, the Burns detective was on the payroll of not only the state of Iowa, but was also being paid by the man he had been hired to investigate. It may have seemed like an ethical dilemma, but it Tobie could have connected the case in Illinois to the case in Iowa, he would have done so. The reward fund connected to the Villisca murders alone was substantial and Tobie – along with the Burns Agency – would have profited from a solution to the crime. But that was not to be. The people of Iowa had been hoping for a solution to their own murders in Illinois, but that turned out not to be the case. There was no connection between the two crimes – other than that the murders were committed with an ax. The Pfanschmidt crime, while baffling, had almost none of the similarities between the earlier murders in Colorado, Kansas, Iowa, and elsewhere in Illinois. I take that back – there was one other connection between the Pfanschmidt murders and all of the others: the murder in Payson would also never be solved. There is an excellent book that has been written about the Pfanschmidt case by Beth Lane called LIES TOLD UNDER OATH. Check it out if you want to really dig into this story. 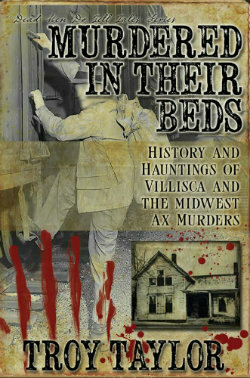 As many readers already know, I mentioned this case in my book about Villisca and the rest of the Midwest Ax Murders in my book MURDERED IN THEIR BEDS.